Photograph depicting IU President Elvis J. Stahr speaking at the podium in the IU auditorium. 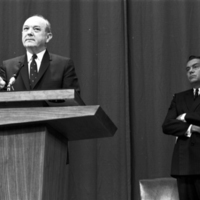 Secretary of State Dean Rusk stands behind Stahr, waiting to deliver his speech. 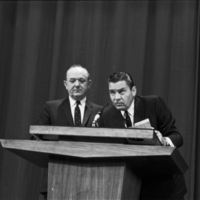 Photograph depicting Secretary of State Dean Rusk delivering a speech at IU. 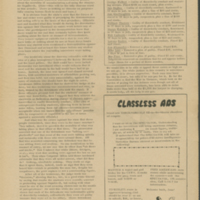 IU President Elvis J. Stahr is seen standing behind Rusk. 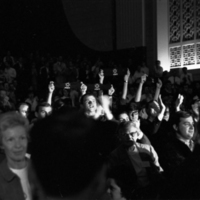 Photograph depicting anti-war demonstrators holding up "Peace" arm bands during Secretary of State Dean Rusk's speech at IU. 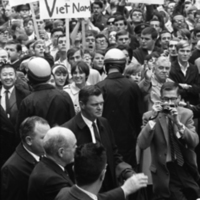 Photograph depicting supporters of Secretary of State Dean Rusk and President Johnson's Vietnam policy, at the time of Rusk's visit to IU. 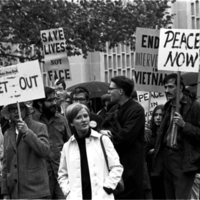 Photograph depicting both pro- and anti-Vietnam war demonstrators during Secretary of State Dean Rusk's visit to IU. 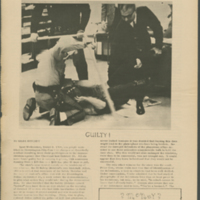 Photograph depicting Secretary of State Dean Rusk arriving to speak at IU. 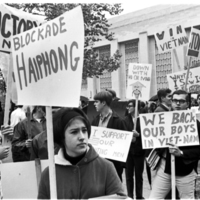 In the background are both supporters of and protesters against the war in Vietnam. 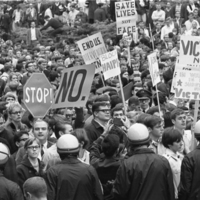 Photograph depicting demonstrators protesting during Secretary of State Dean Rusk's visit to IU. 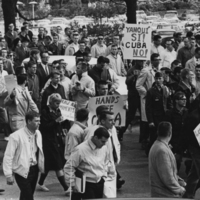 Photograph depicting both pro- and anti-Cuban blockade protesters.